Make your company statement with style and represent your company with promotional travel mugs and tumblers in a durable, stainless steel finish. Our personalized stainless steel drinkware is BPA-free, safe, and are made with the highest quality materials. Promotion Pros offers a variety of customizable travel cups, tumblers, and water bottles with different features that will suit your preference. This 10 oz. 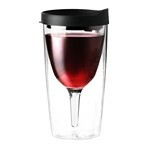 Vino 2 Go Wine Tumbler is a double wall insulated wine cup that helps maintain temperature. Customized 12oz Berlin Stainless Tumbler are a great gift for trade shows, job fairs, and promotional corporate events and will get your brand noticed. 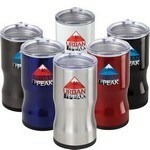 The 12 oz Urban Peak 3-in-1 Insulator features variety of attractive color options and customization ability to Promote your Brand. 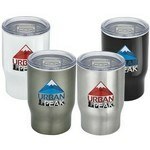 The 12 oz Urban Peak 3-in-1 Tumbler features three-in-one functionality and allows adding brand logo and message for interesting Business Giveaways. The 13 ounce Argo tumbler with flip lid is double walled and made of stainless steel. Our promotional 14 ounce stainless steel white travel mug features a drink-through lid with push button locking closure. 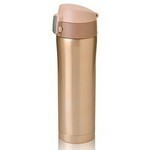 Our 15 ounce Tuscan coffee tumbler with slide lid is BPA free and has a slide open and close lid. This 15 oz. Diva Insulated Cup is a vacuum insulated beverage container with a locking lid. The 16 oz. 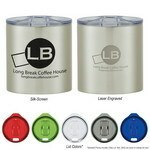 Coffee Tumbler Cup features screw on locking lid and allows adding brand logo for Business Swag!